Designed for hot days, Nalini NA Socks have integrated mesh panels to give you optimum breathability and comfort. Nalini's exclusive Hot Moa XLight yarn is lightweight and woven to contour your feet and prevent blisters. 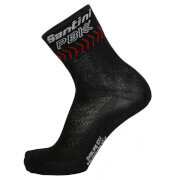 With an enhanced moisture management system and smooth friction-free design, your feet are ready to pedal for hours. Made in Castel d'Ario, Italy at the Nalini Factory.